From 100% natural whole grain oats, which satisfy your hunger & keep you going. The delicious and nutritionally balanced snack from 100% natural whole oats that’s rich in fibre, serves up 5 grams of protein (per bar), and comes in 5 great flavours to support your healthy lifestyle and bring you one step closer to your best you! 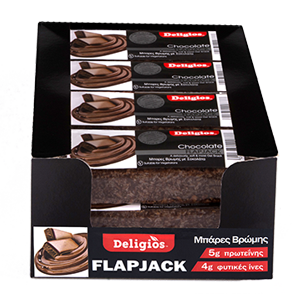 Deligios Oat Flapjacks are a flavourful and filling alternative for those who live life to its fullest, as well as for people with a hectic daily schedule that makes eating a balanced diet challenging. Rich in fibre, they provide carbohydrates and protein as well as flavour and nutrition in one scrumptious bar. 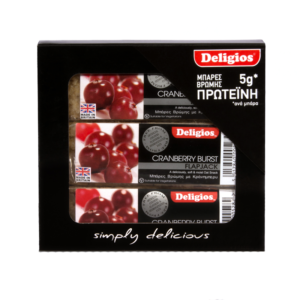 Enjoy them in 5 great flavours: espresso, chocolate, cranberry, raisin, or honey. Deligious Oat Flapjack Bars: A delicious any-time snack! Our range of carefully selected flavours (espresso, chocolate, raisin, cranberry, or honey) lets you choose one you love or enjoy a different one each time. Deligios Oat Flapjack bars offer nourishment and energy: nourishment for those on the move all day who can’t always find a smart and balanced snack; energy for those with an active lifestyle, athletes or otherwise, who need a pre- or post-training snack that will keep them going. Rich in fibre, our flapjacks provide carbohydrates and protein as well as flavour and nutrition in one convenient, hard-to-resist bar. Instead of dessert – they will satisfy your sweet tooth with the added bonus of fibre! Ingredients: Oats, vegetable oil (palm, rapeseed, coconut oils), partially inverted sugar syrup, chocolate (5%), (cocoa mass, cocoa butter, emulsifier: soya lecithin), cocoa powder, salt. Ingredients: Oats, vegetable oil (palm, rapeseed, coconut oils), partially inverted sugar syrup, cranberry (6%), salt. Ingredients: Oats, vegetable oil (palm, rapeseed, coconut oils), partially inverted sugar syrup, sultanas (6%), salt. Ingredients: Oats, vegetable oil (palm, rapeseed, coconut oils), partially inverted sugar syrup, honey (2%), salt.